Cozy hostel, famous for great atmosphere and our friendly staff. Our hostel is located 1 1/2 blocks to the beach and close to downtown, shops, grocery stores and nightlife. 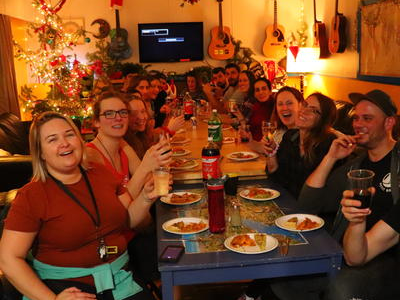 You will feel totally welcome in your "home away from home" at our bright, funky hostel, where you'll meet other travelers from around the world and enjoy all the amenities that the hostel and the Okanagan Valley have to offer. Winter activities include: Skiing/Boarding, Snow shoeing, Hiking, Cross country Skiing... Summer activities include : Swimming, Hiking, Sailing, Parasailing, Wine tasting, Kayaking, Camping .... It's a great place to learn English and to gain Housekeeping and Reception experience. It's also an amazing place to have fun Party Planning and to have a good time. We are currently looking for Spring/Summer help. If you love meeting people from around the world, if you are positive, friendly, well-spoken (extra language is an advantage) and organized feel free to contact us. This can be a great experience for the future. Help needed includes: -Reception (check-in, check-out, phone bookings, making guests feel at home) -Participating in hostel daily activities -Basic cleaning -Painting and repairing We offer: -Free accommodation -Free breakfast, wifi, activities, -Some free evening meals, plus cake! -An awesome team, sun, happiness and extremely good weather -Opportunity to lead day and night activities We ask for 20 hours a week. -Passport required. -Valid work permit preferred. It's a wonderful way to make the most of some beautiful parts of Canada, enjoy outdoor activities, nightlife, meeting people and getting good hospitality and tourism experience. We are located a 5 minute walk from the beach, 50 minute drive from Big White Ski Hill and 15 minute walk from the center of downtown. 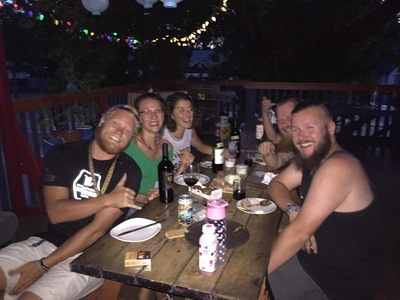 Explore the Okanagan helping out with general repairing and painting at the friendliest hostel! Explore the Okanagan helping out with reception and general cleaning at the friendliest hostel!